Plot and Concept. In the description, it says Darker Still is a combination of Dorian Gray, Pride and Prejudice, and Dr. Jekyll and Mr. Hyde. While the Dorian Gray comparison is a given and definitely merited, I personally think it's more Jane Eyre than P & P, and there is definitely some Dr, Jekyll and Mr. Hyde action going on. I think that these inspirations are simply a glorious combination, and Leanna Rennee Hieber made weaved all the elements together fantastically. From the very beginning, there is an eerie and gothic feel to the book, and once Natalie lays eyes on Lord Denbury's gorgeous portrait, there's no going back. Things get crazier and spookier, and I couldn't stop reading! Characters. Every single character in the book was so vibrant and full of depth and personality. There was an air of mystery over some characters, while others, like Natalie and Denbury, wore their hearts on their sleeves, and you love them all the more for it. Natalie was definitely my favorite character (excluding Denbury, because honestly, it's just not fair to go up against a swoon-worthy gentleman like him) because she didn't let the fact that she was unable to talk get in the way. She was braver than any other girl would have been in that insane situation. Plus, she was spirited and feisty, and managed to convey this without saying a word! Romance. What a sweet romance! Is it weird to be in love with a painting? Because I am certainly guilty! Lord Jonathan Denbury is a young, sweet man that is equal parts charming as he is caring. But he's very handsome, and he knows it, so flirting comes quite easily to him as well. It was great to watch the romance between him and Natalie build as they're thrown together to get him out of his situation. Writing Style. The majority of the novel is written from Natalie's perspective through her journals, which I thought was really unique. It allowed for a deeper understanding of her as a person, because these were her most personal thoughts. There were also a few letters included in the beginning and the end of the narrative written by different people that helped us to get their side of the story. 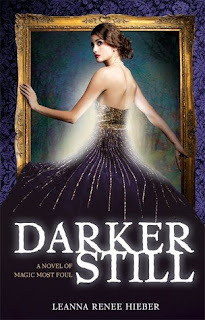 Overall, totally loved Darker Still! If you want a story with a sizzling romance and a dark and twisting plot, then this is definitely your novel. 5 out of 5 stars. rip that shirt completely off? I am reading this right now and am loving it so much! Way more than I was expecting to. Also, that badge is hot. I totally agree with your thoughts on YA promiscuity in literature. It is refreshing to hear this view from an immediate participant in this age group. It's okay to recognize that these are topics relevant in life, but let's keep some innocence alive in out growing up years.